For trading of live Patty shows, the Love From My Lips series, and other unreleased material. 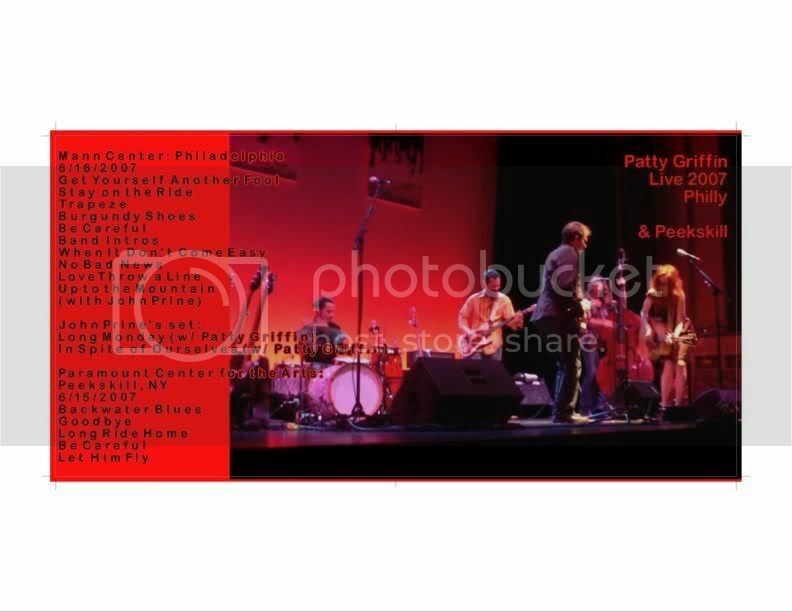 This is a recording of Patty's opening set for John Prine at the Mann Center. The sound is pretty good, but the audience is very obtrusive and the soundstage is wobbly at times because I was sitting on the aisle and had to get up several times to let the latecomers into our row. If you're easily aggravated you may want to skip this one, but Patty did a magnificent job and created a lot of fans with this set (unfortunately, I don't think those people were sitting in my immediate vicinity) and I thought there should be a record of her wonderful performance. I've also included the two songs that Patty sang with John during his set, which are delightful. Along with the Mann Center tracks, I'm including several songs from Patty's stellar show at the Paramount Theater in Peekskill the night before. Although the view was spectacular from our front row seats, we were sitting right in front of Doug's monitor and (as is the case in most venues) the vocals were pretty low in the mix up front. Your brain does a pretty good job of compensating for such imbalances when you're actually watching the show, but they're painfully obvious while listening to the recording. Accordingly, I'm only distributing Patty's three solo songs and the two she played with Doug from that show -- his guitar is still too high in the mix, but at least you can hear Patty's vocals clearly. The first two people to send me a PM and can burn it forward to two others will get a copy mailed to them tomorrow. If you're coming to the 10 Million Miles performance next Saturday, I can hand you one then. OK, CDs going out to Bilbo and Tonto. Check back here soon! While this is not the world's greatest recording, it's definitely worth having for Doug's solo on Love Throw a Line alone. Thanks to Keith, I have several of these to send out. Sometimes you wonder if your walking in the wrong direction. I'll be glad to send out copies---PM me. I can send out two copies, shoot me a PM if you want one. I couldn't find any photos of the Philly show, so I borrowed one from Peekskill. AH i was at this show!!! How do i get a copy of that? I will love you forever if i can get that somehow!